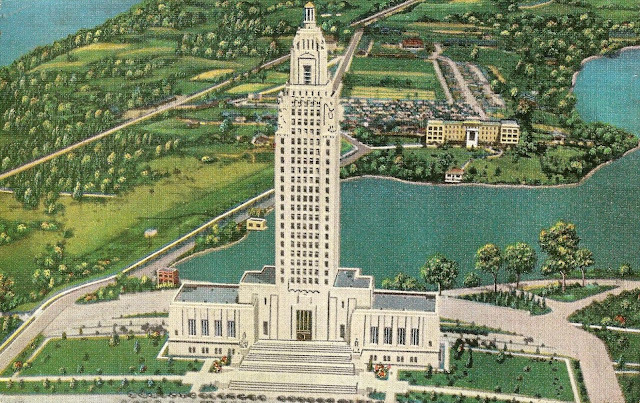 The Louisiana State Capitol, conceived and built by the late U.S. Senator Huey Pl Long, is the tallest building in the South, 34 floors, height to top of beacon light, 450 feet, located on the site of the old State University Campus on University Lake. This U.S. Capitol building was dedicated on May 16, 1932. However, now it is only the tallest building in Baton Rouge and the seventh tallest building in Louisiana. It is the tallest capitol in the United States. It was listed on the National Register of Historic Places in 1978 and was designated a National Historic Landmark in 1982.